25. 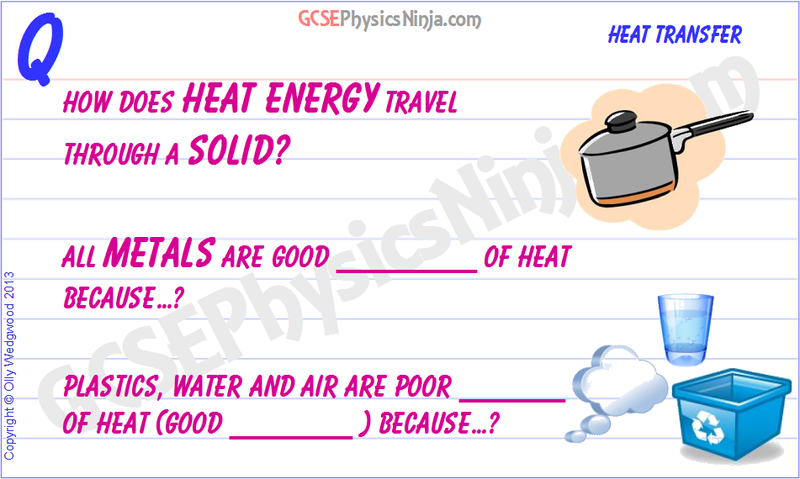 How does heat energy travel through a solid? In a solid, the particles vibrate around fixed positions. As you heat a solid, these vibrations get larger and larger so that neighbouring particles 'bump' into each other, transferring the vibrations. This is called conduction of heat. Metals are particularly good conductors because they also have a 'sea' of freely moving electrons ('delocalised electrons') that collide with the fixed metal atoms, transferring kinetic energy quickly between the atoms. Plastics, water and air are poor conductors of heat (good insulators) because they don't have freely moving electrons between their atoms. Atoms are also spaced further apart than in metals, so vibrations take longer to travel through these materials. Air is a very poor conductor (good insulator), as the gas particles are spaced very far apart. Materials that are able to trap air pockets are therefore excellent insulators - e.g. fleece and wool for clothes, and fibreglass 'wool' for insulating your loft.